This recipe uses the Amish Friendship Bread Potato Flake Starter variation. This post also contains affiliate links. If you click through and make a purchase, the Friendship Bread Kitchen may earn a commission at no additional cost to you. We are grateful for your support! I’m a sucker for sourdough breads straight out of the oven. 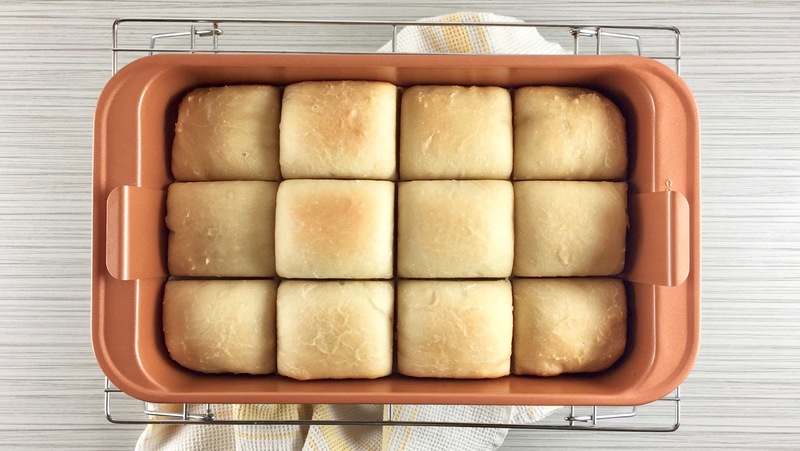 This recipe yielded one loaf plus a second pan with 12 rolls. They say it’s best to let it cool, but what’s the fun in that? I eat it fresh out of the oven with a generous slab of butter. Yum! 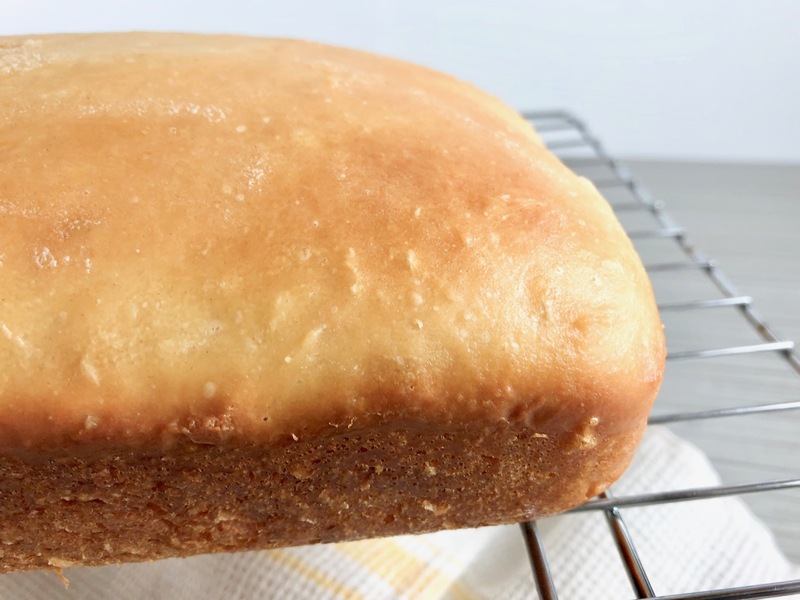 Using a stand mixer with a dough hook or in a large bowl, add 1 cup Amish Friendship Bread Potato Flake Starter, 6 cups bread flour, 1 tablespoon salt, ½ cup sugar, ½ cup oil, and 1½ cups warm water. Mix for 5 to 10 minutes or until dough is smooth and elastic. 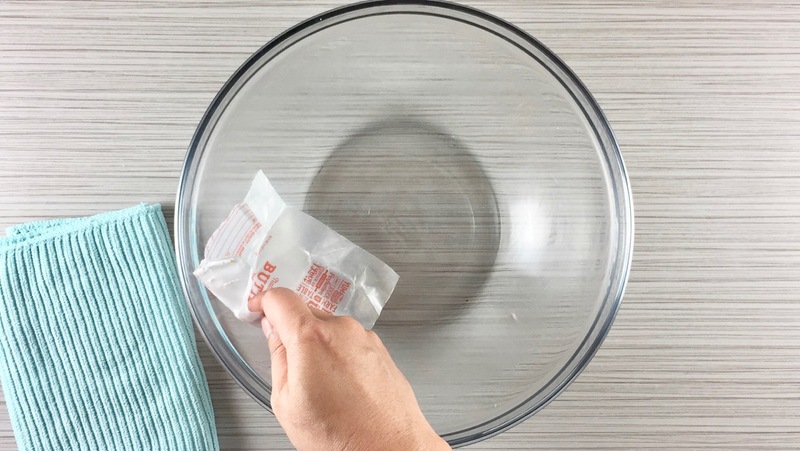 I use butter wrappers to grease my mixing bowls and pans–save them in the freezer every time you use up a stick of butter! Place dough ball in greased bowl and cover with a damp dish towel. Place in a draft-free place to rise overnight (at least 12 hours). Punch down the dough and turn onto a floured surface. Knead for a few minutes to remove an air bubbles. Grease two loaf pans. 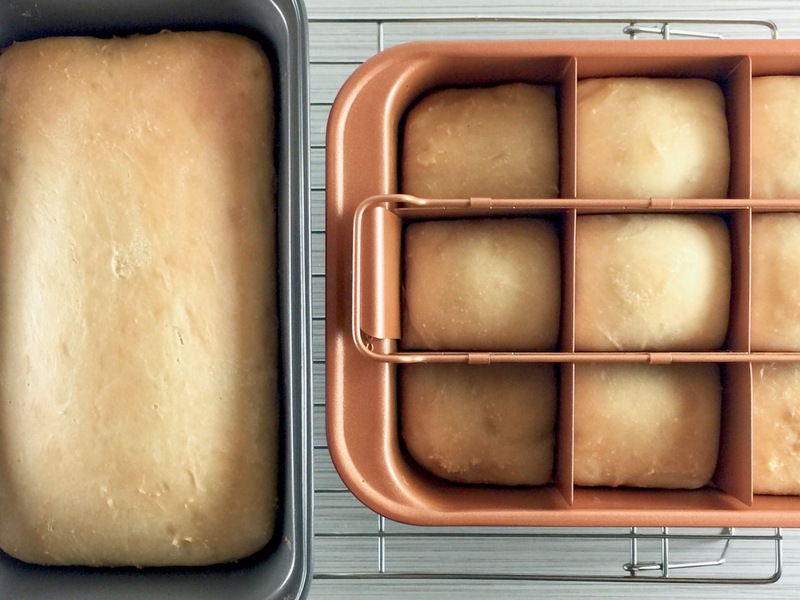 I used one loaf pan and my copper baking pan that has removable dividers so I can make four mini loaves, 12 buns, or one cake. I opted for the buns. Divide the dough evenly between the pans and shape the dough so it reaches the sides. Loosely cover and let rise for 6 to 8 hours. For my copper pan, I added the dough and then put the divider in. You could also remove the divider immediately so the dough is scored and will be more of a “pull-apart” bread. Place the pans in middle rack of oven and bake at 350° F (177° C) for 30-35 minutes or until the top is golden and the bread is pulling away from the sides of the pan. If desired, you can brush the tops with melted butter 10 minutes before removing from the oven. 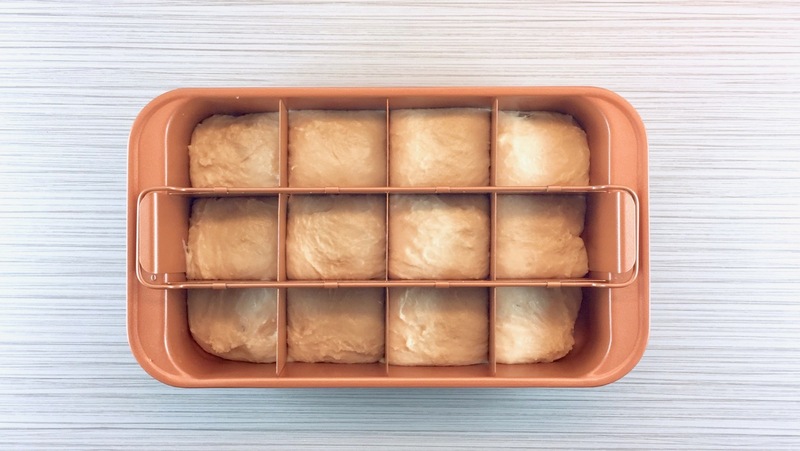 When ready, remove from oven and take the bread out of the pans, placing the loaves (or buns) on a wire rack to cool. This is the basic dough recipe to make sourdough breads and rolls using the Potato Flaker Starter. 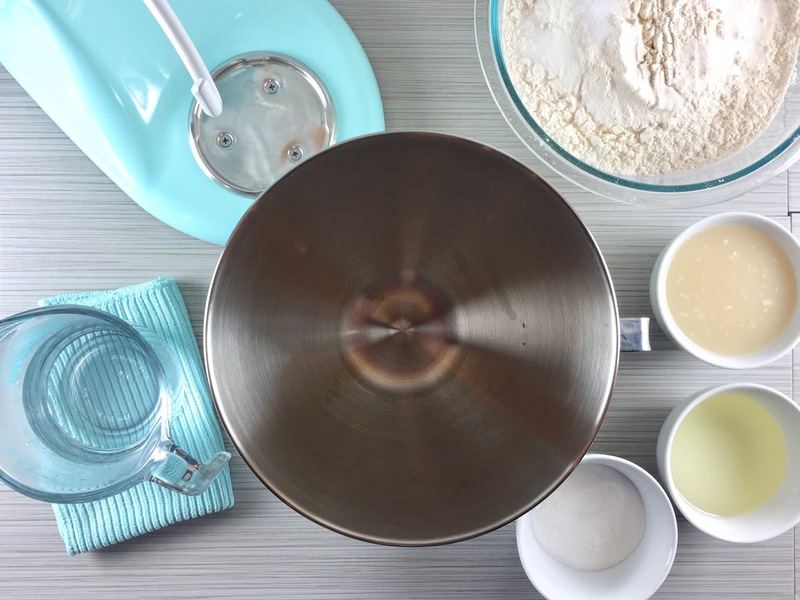 Using a stand mixer with a dough hook or in a large bowl, add starter, flour, salt, sugar, oil, and warm water. If using a stand mixer, knead for 5-10 minutes until dough is smooth and elastic. 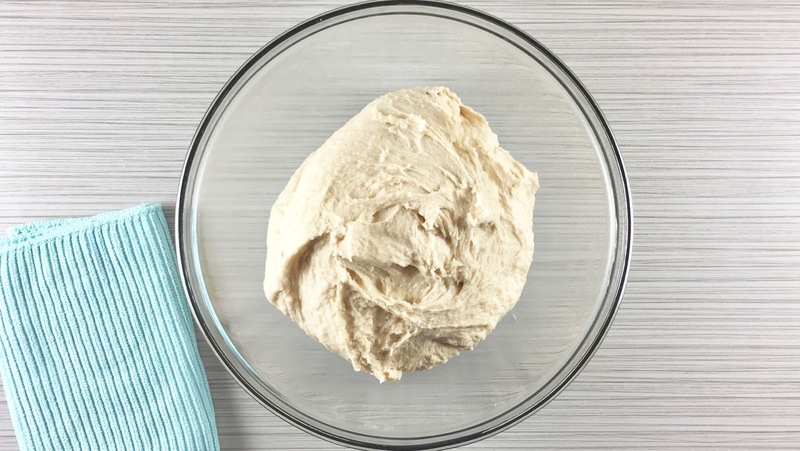 If mixing by hand, knead on a floured surface for 10-12 minutes or until dough is smooth and holds its shape. Place in a greased bowl and cover with a damp dish towel. Place in a draft-free area (a microwave or unheated oven works well). Let dough rise at least 12 hours or overnight. Punch down and turn dough onto a floured surface. Knead for several minutes to remove any air bubbles. Spray 2 loaf pans with cooking spray. 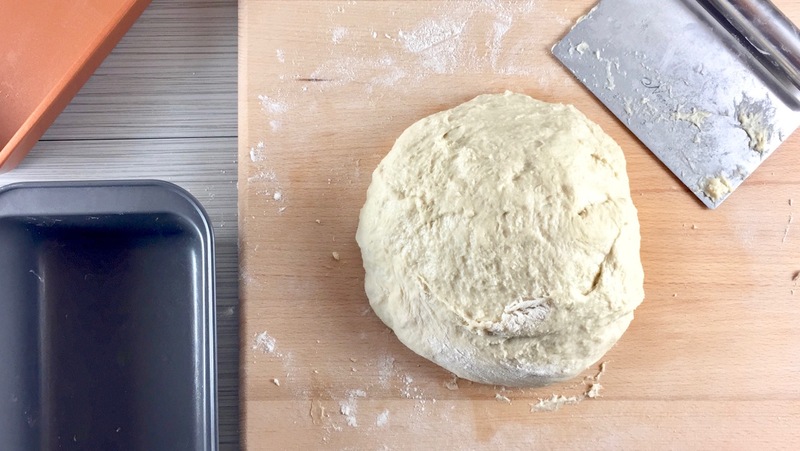 Divide dough in half, shape the loaves and place into the pans. Cover and allow the dough to rise until it has doubled in size, about 6-8 hours. When ready to bake, preheat oven to 350° F (177° C). Bake for 30 to 35 minutes until the tops are golden and the bread has pulled away from the sides of the pan. If desired, brush the tops with butter 5-10 minutes before removing from oven. 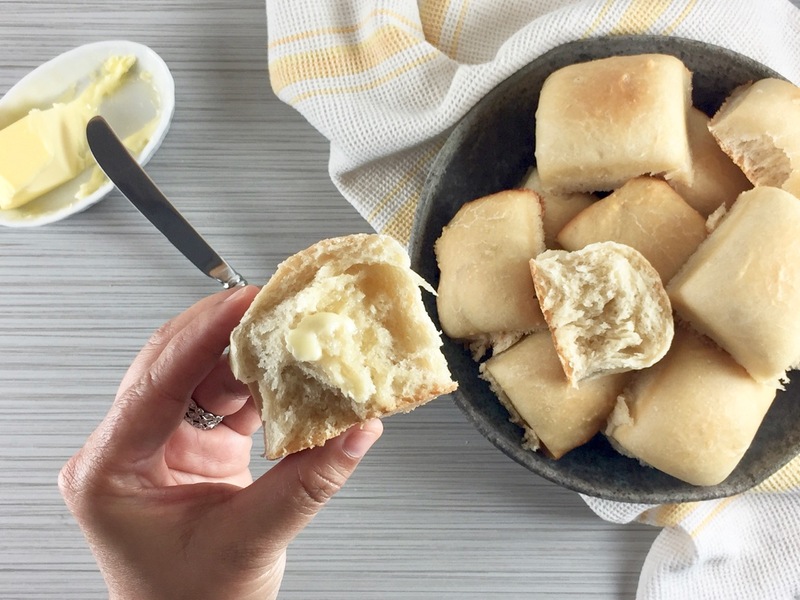 I first tried this bread at my MIL house and it was so delicious! However, if you are not accustomed to making breads, it could possibly be a little tricky to make it. However, do the research, pratice, and you’ll eventually get it. I agree, Cameron! Classic bread baking takes a little more work, but so worth it. Great advice! 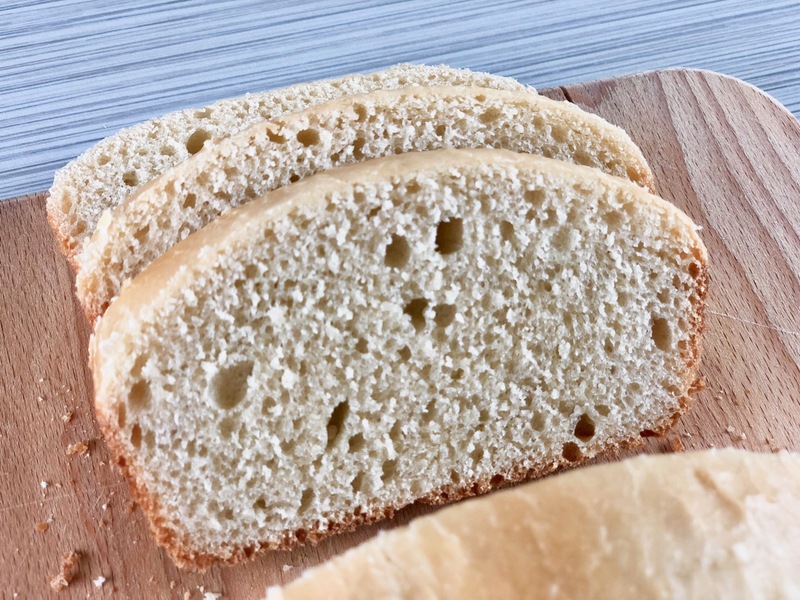 Can I make a larger loaf or pan free loaf of this bread? Only have one loaf pan . 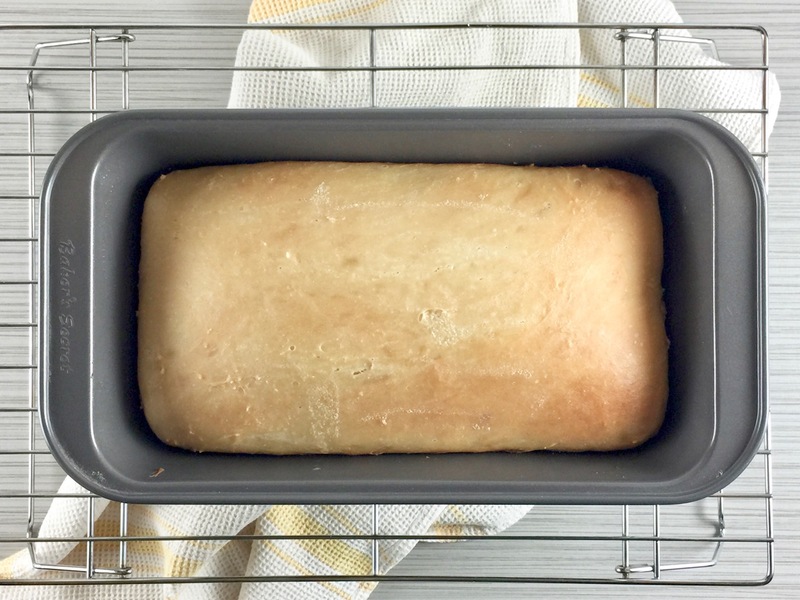 If I make a larger loaf how should I increase cooking time? l would like to know if there is a quicker way to do the bread and can you knead it with a stand mixer! There isn’t a quicker way to make it. However, you can use a stand mixer. I’ve. When making this for years and I use a bread hooks. Have fun! Great recipe, my new favorite! This bread is delicious but it is a time commitment. You really have to plan a day (or two) to make this bread. I have made this in loaf pans, a round cake pan and in muffin tins. All delicious! Any ideas why my bread was rising for about 2 good batches and now the bread is no longer getting a good rise? Hi Ashley! You have to get the timing right with sourdough starters, meaning that you need to feed it on time and also bake within 8 hours of feeding. Unlike the regular Amish Friendship Bread starter that we feature on the site, this one requires refrigeration and constant attention. You also have to maintain your starter by, sadly, discarding or giving away all but one cup. If you try to maintain a starter with more than one cup in the bowl, the ratio of yeast and sugars are thrown off. Hope this helps! Do you use bread flour or AP/SR flour? Hi Hope! Bread flour for this recipe! I just started this recipe this morning and am very excited to try the results. However, my dough never pulled away from the sides of the bowl when kneading in the stand mixer. It was very sticky but was smooth. It was elastic but broke apart if I tried to stretch it. I tried the window pane test but it would fall apart instead of staying together. I’m concerned I didn’t develop the gluten enough *BUT* i kneaded it in the machine for like 12-13 minutes. So I stopped for fear of overkneading. Any advice on what the dough is meant to look like after kneading? Should I have kept going or stopped earlier? Who knew bread making was such a delicate dance?! Hi Christie! It is a delicate dance, isn’t it? Sorry I couldn’t reply in the moment — I’d love to hear how the bread turned out. I think it is a little forgiving — the trick here is to make sure your starter is in good shape (active) as that’s what makes the magic. Hope it worked well for you in the end! David, I separate it into loaves (blobs) and knead each blob 8-10 turns on a floured surface to get it less sticky. I don’t work it for long, just enough to work a little flour in. Is your copper divider pan an 8.5 x 13? Can you tell me what kind of pan it is and where to buy it? Thanks for a great post! Hi Mary! You’re welcome! 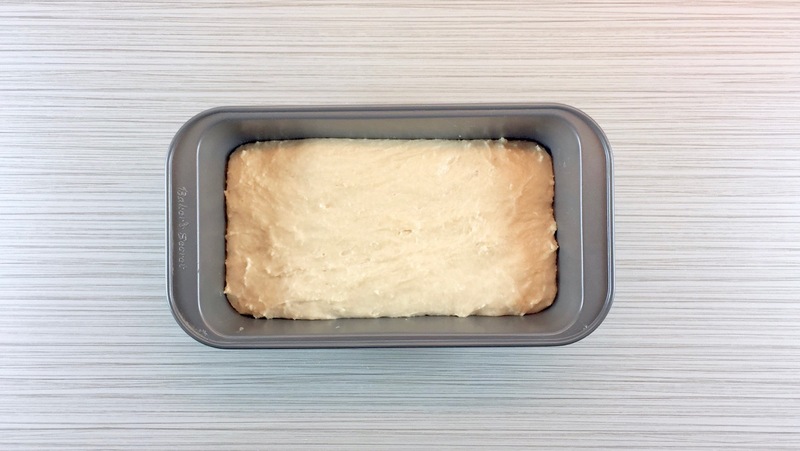 My pan is 7″ x 11″ (baking area). I bought it at Target on sale ages ago and you can get it on Amazon here: https://amzn.to/2ShvIZH. If that seems pricey, try these brownie pans should do the trick: https://amzn.to/2RliLRr. Happy holidays! I am kind of upset right now. I had to discard my potato flake starter and wanted to start another one today. I remembered I had seen the recipe on here for the starter. I had read the recipe before having no problems. Well when I came on here today though, before I could read anything, it always goes right to the video. The video does not do me any good, except for the warm water, it does not tell you the measurement for the rest of the ingredients to put in. Can you please let me know if this page can be fixed so I will be able to read everything and make my starter.